Good news, team! We’ve found a new Earth-like planet not too far from here and you’ve been selected as one of the scientists that will assess its habitability. The satellites have found what looks to be water, and there is sunlight similar to our planet, but you’ll have to determine if it actually has everything humans need to survive long-term. What does that entail? At the most basic level we need water, food, and oxygen. We have a potential water source, and let’s just put the food on hold for now, since we can bring enough space food to sustain us for a few years. What we can’t bring is the essential oxygen that keeps us alive. Where do we get this essential oxygen? Big Question: How do we determine if there is a sustainable source of oxygen on this (or any) planet? On our planet, at least, this oxygen is supplied by plants. Plants are autotrophs, meaning they are able to use the energy from the sun to make their own food. Oxygen just happens to be a by-product of this process. That’s a good thing for us, because humans and most other living things require oxygen, along with food we ingest, to power our bodies through a process called cellular respiration. Though, that’s probably not as much of a coincidence as it may first seem! BUT…how do we identify a plant, especially on this new planet? Most plants are green, but not all. And, not all green things are plants. How do we confirm if there are autotrophs on the new planet? A great first step is to measure the amount of oxygen in the atmosphere, but we want to make sure there is a long-term and stable source of oxygen. This means we need a good way to find autotrophs. 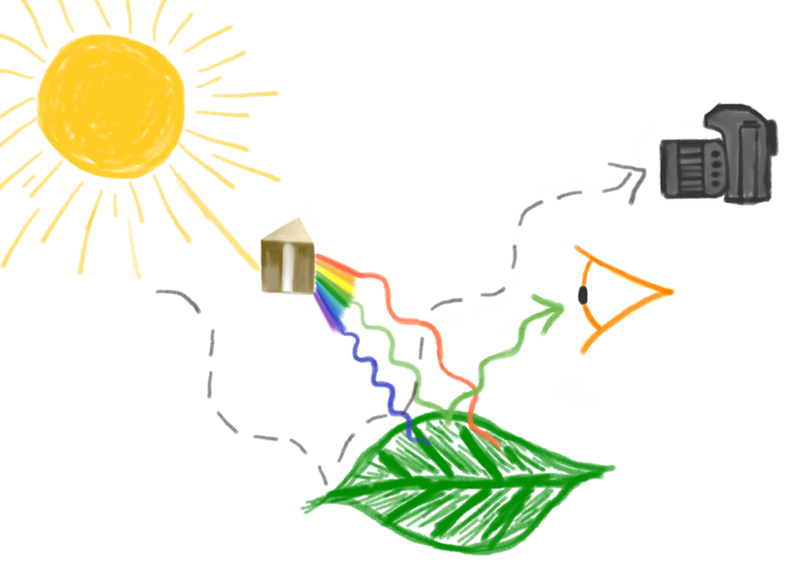 Plants require sunlight for photosynthesis. 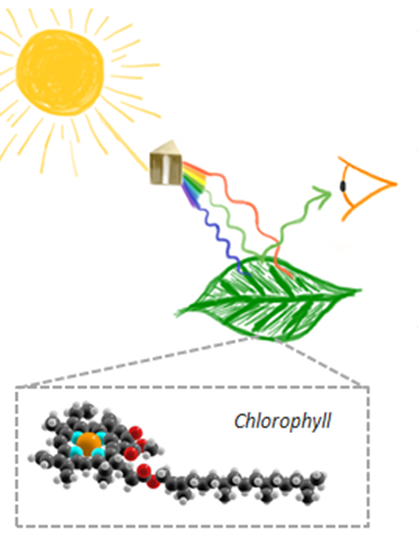 They have a molecule called chlorophyll in their leaves that harnesses the energy from sunlight to power its chemical reactions…but not just any light. 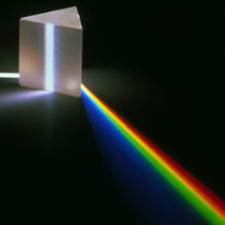 White light is made up of all of the colors of the rainbow. You can actually see all of these colors when a beam of white light is shone through a prism…this spreads out each of the colors enough for us to see a rainbow come out the other side. Each color has its own unique wavelength – purple has a shorter wavelength and has more energy than red. The amount of energy is important for plants. Chlorophyll needs just the right amount of energy to excite its electrons and jump them up exactly 1 or 2 energy states. 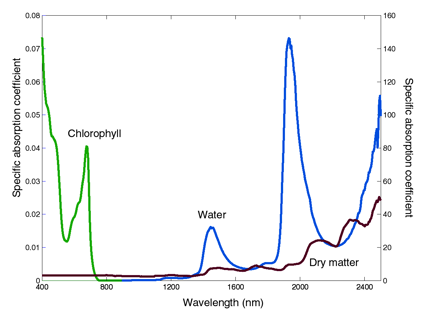 Red and blue wavelengths have just the right amount of energy, so they can be used (absorbed) by the plant. Green light has the wrong amount of energy. This light gets reflected off of the plant because it can’t be used to power photosynthesis. This is why plants look green! 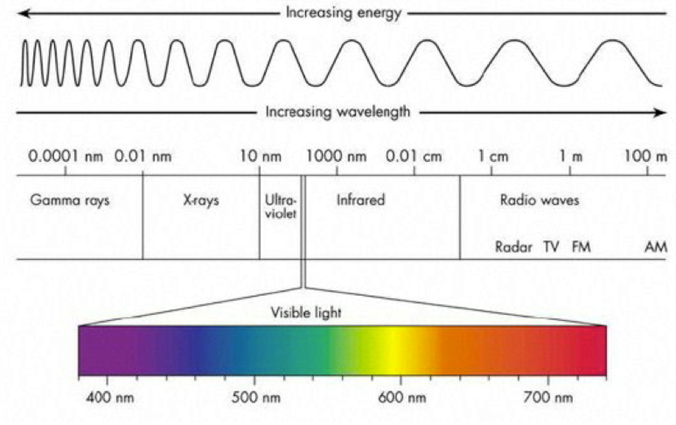 Infrared (IR) light has a slightly larger wavelength than red, and this is also the wrong amount of energy for the plant. IR is also reflected off of the plant. Water and dry matter (like dirt or dead leaves) absorb this IR light. This means we can distinguish between living and dead plants, and we can confirm if there are autotrophs on this planet! We can’t actually see this light with our eyes, it is not in the visible spectrum, but we can detect this with a special camera or detector. 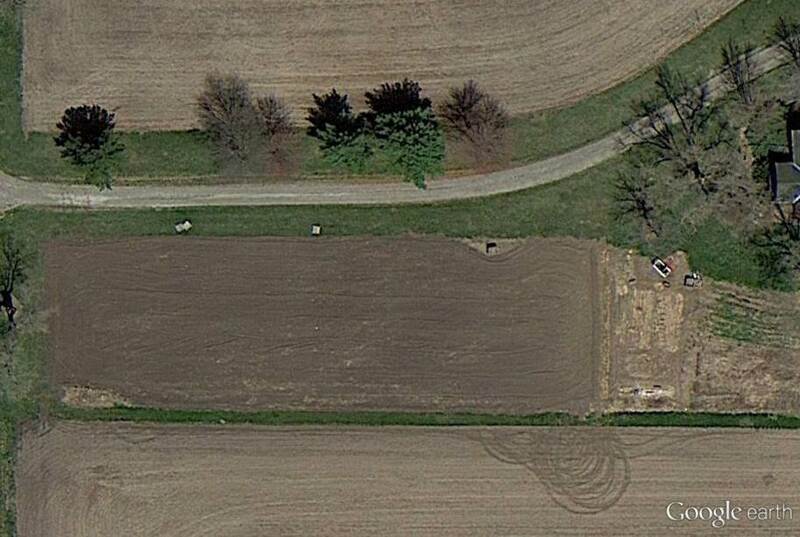 This is a picture that we took on Earth near Champaign, IL with a near-IR detector. 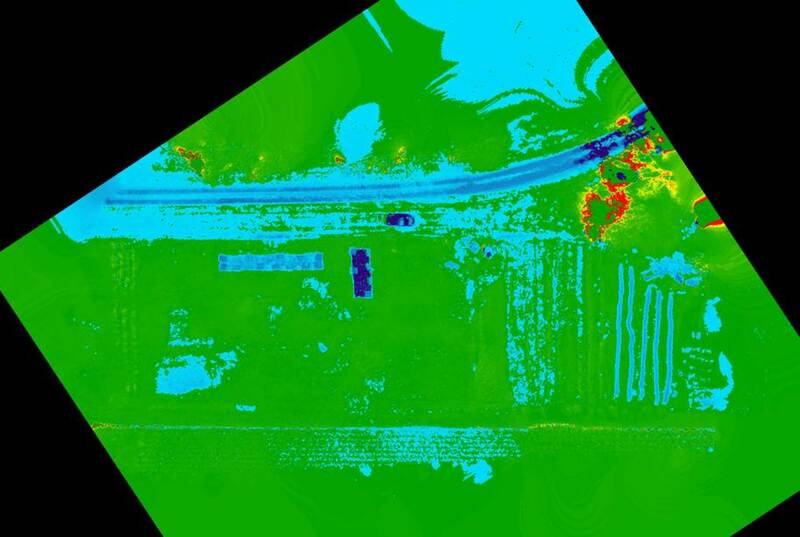 Green to red means more IR reflection, or photosynthesis. The brightest red are these trees off to the right, and we can see the deep blues, which are absorption, are right along where the road and cars were. We can gather quite a bit of information just from these two images – we know that there are photosynthetic organisms and we can also determine how productive they are. 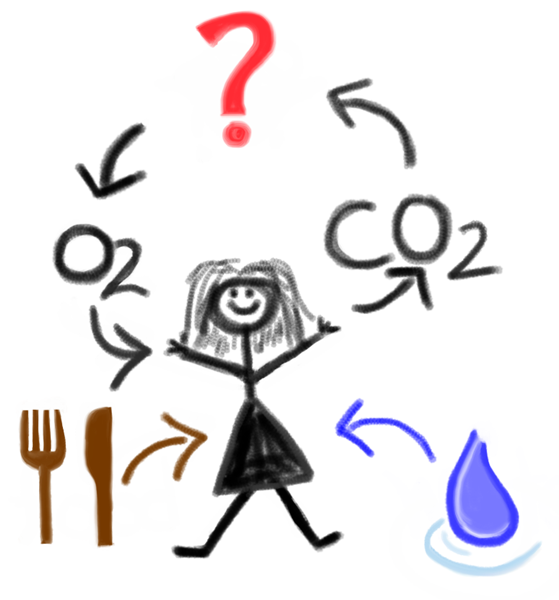 We can determine if there is oxygen being produced and even, roughly, how much! We will have to supplement this with experiments in the lab to see just how much oxygen is released by each of these plants, but this is a great start. 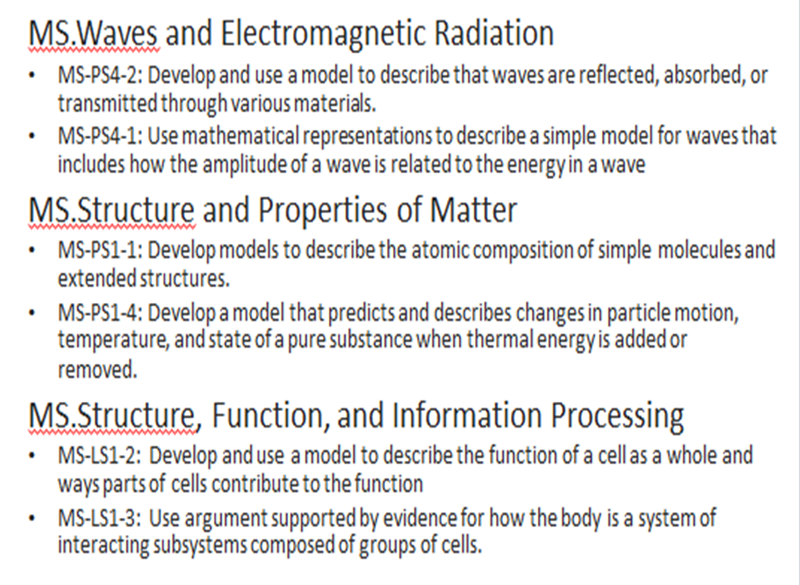 MS-LS1-7 : Develop a model to describe how food is rearranged through chemical reactions forming new molecules that support growth and/or release energy as this matter moves through an organism. 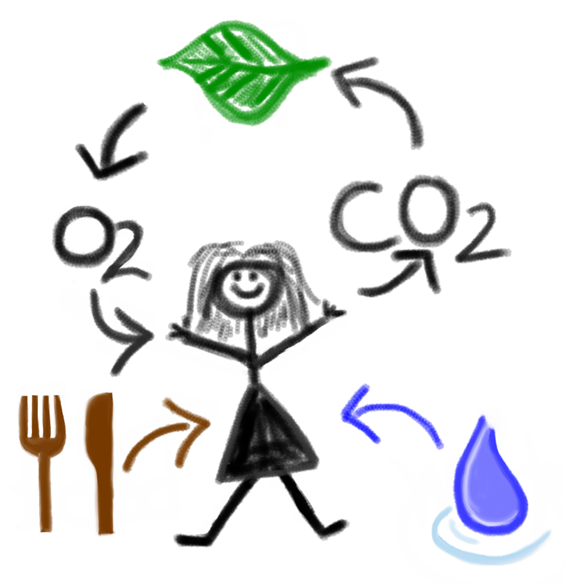 One of the major ideas is obviously photosynthesis, and how that relates to cellular respiration, but you can also talk about the flow of energy through a system, how energy from the sun can be converted into a source of food for the planet, even how our presence on the planet might affect the dynamic of the current ecosystem.